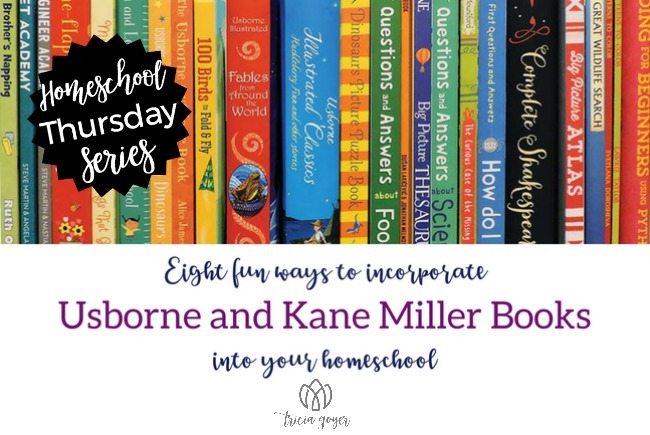 Jessica Hager shares eight FUN Usborne and Kane Miller books to incorporate into your homeschool. When it was my turn to be young (before personal computers and internet were born) the holy grail of non-fiction in our home looked a little something like a set of 22 drably uniformed soldiers neatly lined up to fill the entire bottom bookshelf of the family entertainment center. Each had a different letter on its chest (some had 2 or 3), and the pages were full of small words (lots of them) with scant and scattered images giving my imagination the faintest nudge toward wondering what it was like “out there” in the world. Do you know where I spent the most time while exploring those books? The flags. My very favorite pages to hang out in were the ones that displayed all of the flags from around the world. They were brightly colored and captivating and overflowing with little bits of fascinating information. As a child, it was the visual element that led me back to those pages full of colorful flags time and again, and it’s that same visual appeal that I see my own children gravitate toward today. It’s what makes the non-fiction resources from Usborne so unique and sets them apart! The images engage and the information, while still presented in bite-sized chunks, is rich and smart and relatable to even the youngest readers. We use Usborne books like crazy in our homeschool, and I want to share several of my favorites with you today! If you want to learn more about these incredible resources for your homeschool, join Tricia and I for an evening showcase this Sunday at 8 pm CST. It will be a fun exploration and a closer look at what’s inside Usborne Books & More. And everyone who purchases something at the party will have a chance to win a $25 Usborne credit!! There’s so much to discover when using Usborne books in your homeschooling! All the encyclopedias are excellent, but I especially recommend this one for the younger years. 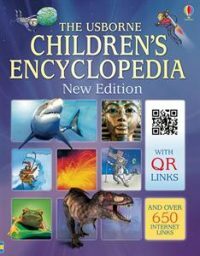 Jam-packed with information, photographs, charts and maps for additional study and research, it contains links to over 150 recommended websites through the Usborne Quicklinks Website, downloadable quizzes, word searches and activity sheets, over 1,500 amazing photographs, illustrations and diagrams, simple, safe activities and experiments, maps of the world and flags of every country. 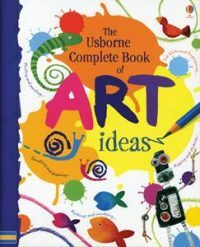 This inspiring book is packed full of creative ideas. It shows exciting ways of using different art materials. Simply follow the step-by-step instructions exactly or use the ideas to create pictures of your own. 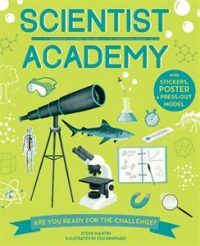 Packed full of great illustrations, fun facts, and absorbing activities, Scientist Academy introduces and then guides young readers through five different types of scientists—laboratory, investigative, space, earth, and life. Practical projects, each carefully designed to introduce the types of skills required by the different real-life scientists, help kids pick up the basics in a fun, hands-on way. Create a pendulum, investigate a crime scene, uncover some fossils, and study the solar system—the sky’s the limit! We now have 10 books in the Academy series including: Vet Academy, Doctor Academy, Engineer Academy, Architect Academy, Astronaut Academy, Pilot Academy, Coder Academy, Chef Academy and Entrepreneur Academy. This book makes measurement relatable to kids! 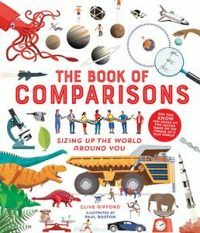 It measures and compares a huge variety of different subjects: the strongest animals, the biggest eaters, the amount of water in the oceans, the deadliest creatures and disasters, extreme journeys, altitudes and depths, the power of natural forces, and much, much more! Peek under all the flaps in these colorful and engaging books—perfect for little fingers and curious minds. 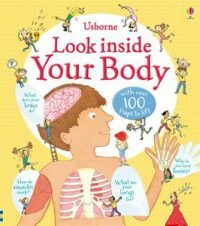 Layers of flaps make this a super fun and engaging human body book! 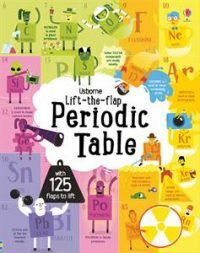 An innovative approach to what can be a dry and tricky subject, this book is perfect for parents and children to share on the road to learning about the periodic table. This beautifully illustrated book is a wonderful addition to any young animal enthusiast’s library! 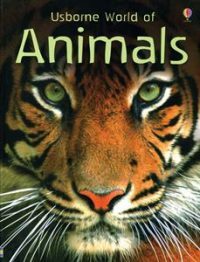 Simple, yet informative text combines with extraordinary photographs, maps, animal facts, classification charts and animal icons to help locate different species. Discover or rediscover the fantastic stories from Shakespeare plays with this complete book! 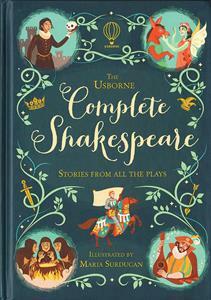 In this beautifully-illustrated book, you will find the thirty-seven plays that Shakespeare wrote, retold for children from 8 to 88! You will be pleased with re-reading the all-time favorites (Romeo and Juliet, Midsummer Night’s Dream or Hamlet) but also with discovering the less well-known stories. I am so thankful for you! I am thankful for your passion for education and literacy! I am thankful that you are eager to provide high quality, educational books for the readers in your life! I am thankful that I get to help you find great books for your family, to help you fill your home with FREE BOOKS and to help you start a NEW ADVENTURE as a consultant with Usborne Books & More! I love that our stories are connected through great books and hope that each book your child reads brings another level of LOVE for others, spark for imagination, desire for adventure and passion for READING! Please do not hesitate to reach out to me with your book needs or any questions you may have! 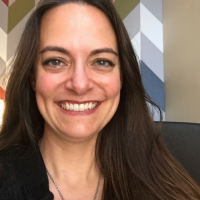 Jessica Hager is a UBAM consultant who loves books and giving children the passion for learning. Hi, I’m Jessica Hager, and I am a work in progress! I love the Lord Jesus and lean on Him through the busy and uncharted seasons of being a wife, homeschool mom to 3, UBAM consultant and well…being a person. I love gardening, cooking, singing, beaches, and mountains and am fascinated by places of history. There are so many that I need to see with my own eyes. I love sharing amazing books with my own family and friends and seeing kids light up when knowledge connects to their heart! My hope is that every child will find God’s purpose for their lives as they explore and learn and discover the interests that speak to their natural gifts and passions.